JM: You seem to be an ideal antidote to a complex, increasingly virtual world—four strings and two octaves; unadorned, acoustic, personal. You owe your big break to a viral YouTube video—and yet your art is so unplugged. What do you think about this paradox? JS: The ukulele is a unique musical instrument. It’s one of the few instruments that doesn’t intimidate newcomers. You don’t feel like you have to be a musician to play the ukulele. It is affordable, portable and above all, user-friendly. Children and adults can maneuver their arms and fingers around the body and neck of the instrument quite easily – leveling the playing field for both tiny and large hands. In 2006, a YouTube video completely changed my life after going viral. I am eternally grateful to the group of supporters who posted it almost a decade ago. While My Guitar Gently Weeps is still my favorite song to play night after night, and it’ll continue to evolve as time goes on. Recently, much of what I do on stage appears to be unplugged and acoustic – but there’s a completely different side to the ukulele that relies heavily on amplification and electronics. Experimenting with effect pedals to alter the tonal characteristics of the two-octave instrument can be quite satisfying when used in the proper context. There’s no greater thrill than stepping on that distortion pedal and ripping through a 32-bar solo like Jimi Hendrix. JM: Your covers of pop classics are more than cultural reminiscences. They seem to extract the essence and cast it in a new simplicity and intimacy. Do you choose the song, or does the song choose you? JS:There are so many songs that I think would sound fantastic on the ukulele – especially the ones with a bit more complexity and obscurity. The ukulele has the natural ability to cut through the sophisticated outer layers of a composition and bring out the two-year old toddler in a song. Arrangements on the ukulele will often make you forget how old you are, and suddenly you’re smiling and wanting to go on a three-month vacation. JM: Your career seems evenly balanced between the studio and the stage. What is the interplay there? JS: A photographer told me that once he takes a photo, it becomes worthless to him. Although I don’t completely agree with that statement, I do believe there’s something magical about live performance – music being created right in front of you for that precise moment in time. As an observer, you play an important role in the creation of the experience. That is why live recordings are never quite as powerful as the actual concert. Art is truly a process. It is a living, breathing thing that is impossible to contain. Music needs the freedom to change and evolve spontaneously as it is being experienced – and it’ll never be truly experienced the way it was meant to be once it is created. JM: How often does a new song grab you? How obsessive are you about translating it to the uke? JS: I hear songs that I’d like to cover all the time. Sometimes I can figure them out in my head, but most times I’ll need to have my ukulele in hand. When I committed myself to Bohemian Rhapsody, I knew that it wasn’t going to be a smooth flight. I worked on that arrangement for ten straight days before finally feeling good about my decision. Learning the right notes to play is not the problem. The difficult part is executing each note with conviction while expressing the right feel and timbre for the song. Being an instrumentalist is tricky. You really have to believe you’re a singer. You need to play that role – like an actor. You have to become the song you’re playing. Use your whole body and every muscle in it to convey exactly what you feel. You can’t have your body doing one thing, and your face expressing something entirely different. Everything that you have control over must commit fully to a single emotion in that precise moment. JM: The decline and erosion of public music education has been a big concern of yours. Can you say something about this? JS: Music in education is important because it builds character in young people. It’s good for the human spirit and inspires the soul. When people feel good, they do good things. Music strengthens the community and breaks down social and economic barriers. Music programs like concert and marching band, as well student orchestra, gives individuals like myself, who don’t excel in organized sports, a chance to experience what it’s like to be part of a team. In band, you have to train mentally and physically, commit to rehearsals and take responsibility for your part in the music. There’s a common goal, and when it is reached, there is a feeling of accomplishment and pride that is not experienced in trigonometry class or world history. Music is important because it exercises parts of our brain that help us to excel in other areas of academics. Everyone has P.E. (physical education) in school where they are required to play basketball, tennis, dodge ball, or go swimming for an hour. Well, music is simply P.E. for our brain. JM: In Michael Lawrence’s film Bach & Friends you dropped a zinger of a statement: “Music is the vehicle for understanding the kind of person that you are.” How does music function as a mirror for you? JS: Music is truth. When you are playing your instrument, you can’t hide who you are. All of your experiences, good and bad, are revealed. All the lies you’ve told, the people you hurt and the regret that you bury deep in your soul come to surface with every note. Music is not just the universal language, but it’s the language of the universe. It is the language of human emotion – and whether you play an instrument or not, you communicate in this language every day. Music is not heard, it is felt. Music is in a smile, a hand on the shoulder, a pat on the back, a gentle kiss on the forehead. It’s in the way we treat people, help a friend, love our family. Music is everywhere. By understanding music, we can recognize who we are and our place in this world. JM: You worked with legendary producer Alan Parsons for your 2012 album Grand Ukulele. That must have been cool. JS: Working with Alan Parsons was an amazing experience. I learned so much about the recording process, microphones, preamps, mixing techniques, etc. Parsons’ understanding of the studio is equivalent to a classical violinist’s understanding of his or her instrument. JM: It is no exaggeration to say you have initiated a ukulele renaissance. You must be a hero to uke manufacturers. JS: I’ve always been a fan of Kamaka ukuleles. They were the first family to start manufacturing ukuleles in Hawaii almost a hundred years ago. In fact, 2016 will be their 100th anniversary. 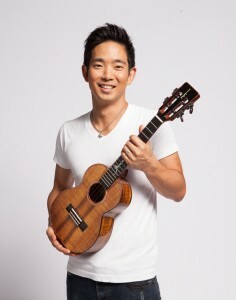 I currently play a Kamaka tenor ukulele, which has always been my instrument of choice. When I was a kid, I referred to it as the Excalibur of ukuleles. JM: Do you ever feel you are nearing the outer planets of the uke solar system? JS: There is still so much more to be discovered with the ukulele – this is just the tip of the iceberg. I’m just a big fan of the ukulele and I’m most excited to see where people will take it next. Twenty-five years from now, I want to hear the Yo-Yo Ma of the ukulele, the Charlie Parker of the uke, the Ravi Shankar and Muddy Waters of the Hawaiian instrument. The ukulele is still young, and it’s definitely experiencing a tremendous growth spurt at the moment. But there will be many milestones for the uke in the near future and I’m looking forward to seeing as many as I can. My, this superb writer and interviewer (Joe) landed an interview with someone (Jake) with the mind, heart and soul to respond on equal terms. Dynamite interview!